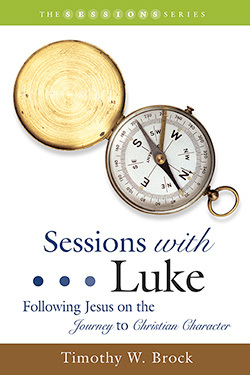 Sessions with Luke is a ten-lesson study designed to help participants explore and embody Christian character through reflection on biblical truths illustrated in the book of Luke. Each session is followed by a thought-provoking resource page of questions that allows for a deeper experience of the scriptural passages. These resource pages can be used by seminar leaders during preparation and group discussion, as well as in individual Bible study. Timothy Brock takes readers on a journey through Luke’s brilliant collection of memorable stories, challenging teachings, and well-known parables describing the life and work of Jesus Christ. Ultimately, the stories found in Luke’s gospel demonstrate that accepting the invitation to follow Jesus requires a radically transformed relationship with God and with other people. Followers of Jesus are encouraged to emulate and to embody the character of Christ as they create a lifestyle of obedience to God and service to others. Timothy W. Brock serves as Assistant Professor of Christian Education at Campbell University Divinity School in Buies Creek, North Carolina. He is a graduate of the University of Alabama (B.S.) and The Southern Baptist Theological Seminary in Louisville, Kentucky (M.Div./R.E. and Ed.D.). Prior to his appointment to the divinity school faculty in 2002, Dr. Brock served congregations for eighteen years in Alabama, Indiana, Kentucky, and Virginia.